Blog Posts -- The "Underbrush"
You have just employed the latest genealogical tool to research your genome to find new branches of your family tree. Your get an impressive looking chart back from the lab that looks suitable for framing but what does it all mean. On the surface it tells you nothing about your family history. Were you under the impression that if you swabbed the inside of you cheek and sent the sample to the lab, they would be able to tell you your entire family history. 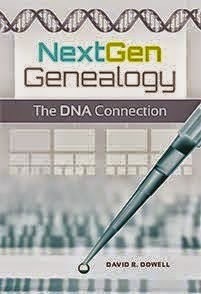 DNA is an important new tool for 21st Century genealogists. Someone has said DNA testing has put the "gene: back in genealogy". However, it is a supplement to and not a replacement for traditional family history research. 1. CSI type identification of a specific individual. 2. Medical testing for specific genes that may have an impact on various health risks. 3. Paternity testing to establish the father and/or mother of a specific individual. 4. Haplotype testing for deep ancestry which may have sociological value in identifying one's ancient clan or tribe. 5. Genealogical testing to establish or eliminate possible family relationships. It is the latter two types of testing that will be discussed in this series. Test results for an individual are meaningless for family history purposes when seen in isolation. They take on meaning only when they are compared with databases containing the results of many people. In this case big is definitely better. The larger the database against which you can compare your results, the more likely you will be able learn something useful about your family history. Genetics is a relatively young field; and it is currently one of the most dynamic areas of scientific research. New discoveries are made constantly. What one thinks one knows today is like to have changed within a few months as more is discovered in the labs. For the first decade of the 21st Century, the most potent use of DNA in genealogy research has been for y-chromosome comparisons. Only males have y-chromosomes. Therefore, only males can be tested for y-chromosome DNA. Men pass a copy of their y-chromosome genes to each of their male offspring. In a vast majority of these intergenerational transfers, the markers on the y-chromosome genes are copies exactly. This allows researchers to follow lines of ascent backward in time. However, in a very small percentage of transmissions, mistake or mutation is made in the marker copying process. This small number of mutations is what allows us to differentiate between different family lines. While y-chromosome results are useful, the test results only apply to a small part of a male's family tree. 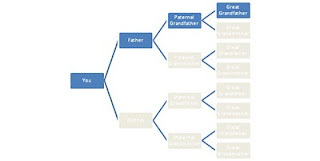 In the following illustration, note that the y-chromosome test result only give information about one of the eight great-grandparents. This decreases with each preceding generation to one of sixteen great great-grandparents and one of thirty-two great-great-great-grandparents, etc. Paternity Testing Corporation is accredited by the AABB. The AABB makes on-site inspections of our laboratory every other year. They check our testing protocols and equipment, and also check all documentation in a number of individual paternity tests. They make certain that every accredited laboratory is following accepted procedures, and is performing at least the minimum required level of testing. Some of this information is getting dated but the basics remain pretty much the same.